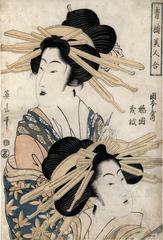 Each of the prints in this series shows two famous courtesans and the name of the brothel which they worked for. So far we have been unable to read the names on this print, but in time we will work this out. Notice the green lower lip on the courtesan at the top - a fashion statement - and the blackened area at the mouths of both of these women meant to portray their blackened teeth - another fashion statement.